Marquee Madness: Premier League's Eto'o, Defoe Headed To MLS? If reports are to be believed, Samuel Eto’o and Jermain Defoe may be on their way to the MLS after this summer’s World Cup. A bit of advice for those still not quite acclimated with watching the English Premier League on NBC. Soccer – the beautiful game – is the world’s most popular sport, yet in the United States it has long only been found in the furthest most recess of the minds of many Americans. The sport, however, is on the rise. The question is will it ever be as popular in the U.S. as sporting giants like the NFL or NBA? The answer is, without a doubt, yes. And it may even surpass them due to the global reach of soccer. This U.S. soccer takeover, however, will take a great deal of time. One of the keys for the growth of the world’s greatest sport in the U.S. is to gain the allegiance of young fans, which it has been doing. Richard Luker, the man behind many ESPN studies, discovered in a 2012 ESPN Sports Poll that soccer was the second-most popular sport among youth aged 12-24, a key demographic since it represents America’s future. American Football was the top ranked sport for the demographic. “It is only a matter of time ’til we see soccer take off in a big way,” Luker said in an interview with ESPN’s Roger Bennett. Of course, many more things – besides the passing of time – have to go right for a soccer takeover to happen in the U.S.
Quality soccer needs to be exposed to the American public on a wider scale. Whether it’s more friendly matches between big name league clubs or international clubs played in U.S. stadiums, or more international and MLS games televised on national TV, the buzz on soccer needs to get out more. The NBC Sports airing of all English Premier League games that began on Aug. 17, 2013 is a move that shows the growing demand of soccer stateside. An American born soccer superstar would do wonders for the American fan base and attract new fans. It would give American fans someone to call their own. This superstar has to be someone who can run with the likes of Argentina’s Lionel Messi or Portugal’s Cristiano Ronaldo (two of the sports best), or at the least be mentioned in the same breath with them. This superstar has to be someone fans will want to follow off the field as well, someone who even non-fans of the sport can recognize or know by name. For example, I have never watched a minute of golf or NASCAR in my life but I know very well who Tiger Woods and Jeff Gordon are. Given time and a continued youth interest in the sport, this star will emerge. 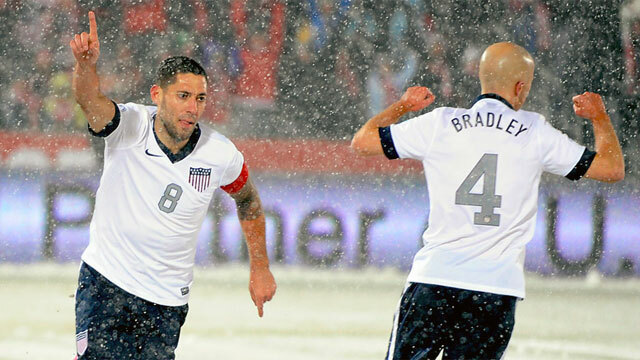 Another key for U.S. soccer growth is fast approaching this summer: the 2014 FIFA World Cup. For soccer to gain strides in popularity in the U.S., the men’s national soccer team must make quality World Cup bids. A championship would catapult this growth but, at this point in time, it is as close to impossible as you can get. All the U.S. men’s soccer team needs is to put on a good show. They need to make a good run and to turn some heads. There has never been a greater opportunity to do so than in this upcoming World Cup. Isn’t the U.S. in the “group of death” with soccer powerhouse Germany and two very strong teams representing Portugal and Ghana? Yes, they are. And that, contrary to popular belief, is a very good thing. Getting placed in the infamous “group of death” is the best thing that could have happened to U.S. soccer. Nothing unites like adversity, and the adversity this U.S. team faces has the opportunity to unite fans and gather new ones by creating excitement through an underdog story. If they make it out of the group and make it into at least the second round of elimination games, heads will turn. Old fans and new will watch, be united, get excited and cheer their hearts out – as they did during the 2010 World Cup when Landon Donovon scored the game-winning goal against Algeria. A goal that sent the U.S. soaring into the next round of play and a moment that won Best Moment at the 2010 ESPY Awards, beating out all other sport moments for the entire year – which should be as definite a sign as any that soccer is on the rise and waiting patiently for its reign to begin in the United States. A 2013 graduate of Rhode Island College, Juan lives in Rhode Island and is satisfied with simple things.